The Certified Angus Beef® patty topped with sliced ham, a sausage patty, a fried egg, a portobello mushroom, arugula and garlic aioli and served with a side of baked beans definitely satisfied hubby's appetite. I had the Jamaican Jerk Burger from Montego Bay, Jamaica. Ooh yum! The Certified Angus Beef patty topped with banana pepper rings, mango jalapeño cream cheese and jerk mayonnaise was super delicious! I loved the crunch and the tartness of the banana peppers and the melted goodness of the cream cheese! Yum! Hubby and I also tried the custom cocktails that perfectly complemented the World Burger Tour offerings we tried. Served in Hard Rock’s iconic mason jars that we were able to take home, our server suggested a few drinks which would pair well with our burgers. The drinks were refreshing and perfect for summer days! I could've had a few more of these, they were so good! 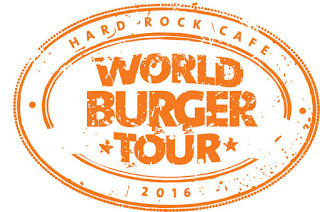 The limited-time World Burger Tour menu is available Sunday, May 1 through Thursday, June 30, 2016. Make sure you visit your local Hard Rock Cafe soon! Disclaimer: My family and I were offered a complimentary meal in exchange for this blog post. All opinions are mine.